Ready or not, retirement may be around the corner. Maybe it is coming early or long coming. Either way, it will be a time for adjustment for many people. By some estimates, 10,000 baby boomers will retire every day. Here are five things to do before retirement. Review investment portfolio and implement adjustments to reflect retirement needs. The purpose of an investment portfolio often changes as someone enters retirement. An investment strategy that appropriate for building assets may not be appropriate for spending down assets. During the building phase, people invest savings for goals that are years and decades in the future. In the spending phase, pull money out of the portfolio to fund goals today and the immediate future. Too much risk and bad timing can wreak havoc for someone making the transition to retirement. Before retirement, time and new savings can help a portfolio recover after a market sell-off. In retirement, portfolio recovery is greatly challenged. Time for recovery is limited. Many people are spending not adding money to their portfolios. Imagine being someone in 2008 planning to retire in 12 months. You believed you were ready for a happy and long retirement with your stock portfolio and home equity. 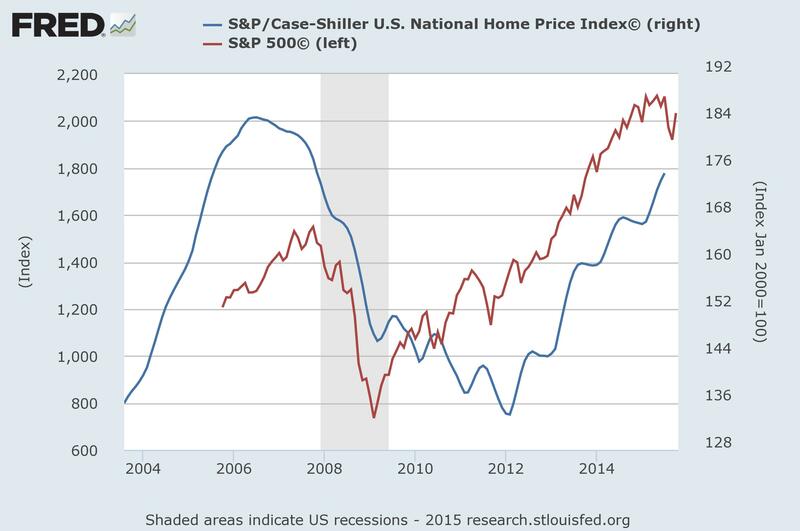 Both stocks and homes were priced near their all time highs. As retirement day approaches in 2009, the happy and long retirement was in serious doubt. With the drop in the market shown in Chart 1, the stock portfolio is now worth half and the home lost one-fifth of its value. The retirement does not look so promising anymore. You may need to delay retirement, work in retirement or scale back retirement spending. It is hard to predict when unexpected things happen. When they do, retirement plans can be derailed. Had retirement income, as discussed above, been diversified beyond a stock portfolio and home equity, retirement security would have been much higher. Having diversified income sources means having unrelated income streams. A disruption to one should not have much effect on others. Different types of income included guaranteed income, income from investment and liquidity accounts, income from work and money from rental property, business and other sources. I would start with guaranteed sources of income as the first group. The payor has an obligation to provide a fixed income stream over a predetermined period of time. Examples include Social Security benefits, pensions and annuities. Guaranteed sources are an important start place because retirement security increases if guaranteed sources cover a greater portion of the estimated retirement income need. Unfortunately, most workers do not expect guaranteed sources to be a major sources of retirement income. By itself, Social Security will not enough for most people. Less and less people have access to pension benefits. Individuals can buy annuities for guaranteed income, but annuities may not be suitable for everyone. Next, I would consider investment accounts, which will likely be the major source of retirement income. Investment accounts include retirement accounts such as traditional and Roth IRAs, and employer sponsored 401(k), 403(b) and 457(b) accounts. I would also add traditional brokerage accounts. Developing a strategy for retirement income from investments can be complex. It requires careful consideration of your goals, tax situation and your holdings. Two important components are asset allocation and asset location. Asset allocation will determine the long-term growth and riskiness of an investment portfolio. It will also influence how long a portfolio will last and the security of the income stream. Asset location is about choosing the type of account to hold different investments for greater tax efficiency. A popular strategy is to hold investments that provide interest income in tax-preferred retirement accounts because the income may not taxed until it is taken out of the account. If held in a taxable account, the income would be taxed regardless if the money leaves the account. Done properly, taxes can be lowered, leaving more money for retirement. Liquidity accounts are primarily bank accounts. They include CDs, savings and checking accounts. Bank deposit accounts are the most liquid and among the safest. The price for liquidity and safety is that money in these accounts are not expected to grow much. The risk is that inflation erodes the purchasing power of money in liquidity accounts. Wages from part- or full-time work during retirement is becoming increasingly popular. About 73% of current workers expect employment to be a source of retirement income according to the 2015 Retirement Confidence Survey by the Employee Benefit Research Institute. The Survey highlights that many people work during retirement for reasons that are not financial. Nonetheless, one must consider that earning too much in retirement while receiving benefit can reduce the payout from Social Security. Catch up on your retirement savings. Someone over age 50 can make catch-up contributions to boost their retirement accounts. Catch-up contributions are up to $6,000 in 2015 for 401(k), 403(b) or 457(b) on top of the maximum contributions of $18,000. Catch-ups are up to $1,000 in addition to the annual contribution limit of $5,500 for traditional and Roth IRAs. File for Social Security about four months before you want benefits to begin. Having spent time waiting in a Social Security office, I am glad that online filing is available at www.socialsecurity.gov. Benefits can start as early as age 62 and as late as age 70. Full retirement age is 67 for someone born after 1960. Early retirement reduces benefits. Late retirement increases benefits. For example, someone retiring at age 62, 60 months before their full retirement age, would receive monthly benefits 30% less. By waiting, benefits would increase by 8% per year or 24% if benefits did not start until age 70. There is no single best answer for when to start receiving Social Security. The decision depends on a variety of considerations. They include expectations of longevity, health and work. Working while receiving Social Security can result in a reduction in benefits. Someone can also receive Social Security based on a spouse’s (including ex-spouse) work history. Smart planning can help maximize Social Security benefits in retirement. Know Medicare options before the initial enrollment period. The initial period lasts for seven months, beginning in the three months before becoming eligible at age 65. Medicare is an alphabet soup of many ingredients. Traditional Medicare includes Part A for hospital and Part B for medical. Traditional Medicare is fee-for-service based on a 80/20 model. For coverage of the remaining 20%, many private insurance companies sell Medicare supplemental policies, a.k.a. Medigap. Medigap policies have names that go from Plans A through N. Each plan covers 20% differently. Part D covers prescription medicine. Part C, a.k.a. Medicare Advantage, is the managed care version of Medicare. It covers Medicare Parts A, B and often D. The popularity of Medicare Advantage has been increasing. At present, it represents about 30% of people on Medicare. Based on the experience of elderly family members, I believe it is important to consider before initial enrollment the pros and cons traditional Medicare and Medicare Advantage. Although there were opportunities to switch, they found making the change very challenging. The Medicare website at www.medicare.gov provides a wealth of information. It may be worth consulting Medicare health insurance specialists to appreciate the Medicare alphabet soup.